In India you will commonly find large trees marked by a tangle of branches, roots, and trunks mixed together in a sort of elegant disarray. 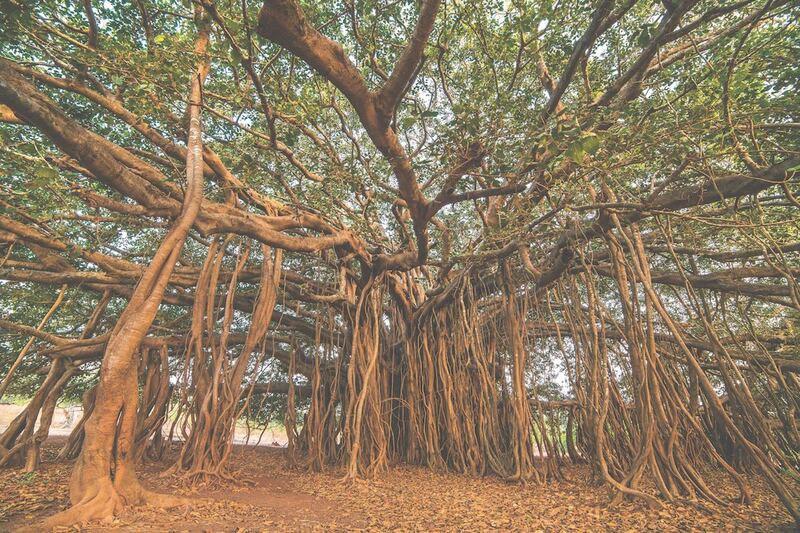 These trees, known as “banyan,” can be found throughout the country near homes, temples, villages, and roadsides. The banyan is considered the national tree of India and the long and deep roots have come to symbolize the country’s unity. The sprawling banyan tree (an old one can reach more than 200 meters in diameter) provides much needed shade. According to historians, Alexander the Great camped under one of these trees that was large enough to provide shelter for his army of 7,000 men. The word banyan comes from the word “banias,” which refers to the Hindu merchants who used to conduct business under this tree. Asia’s oldest stock exchange, the Bombay Stock Exchange, was also born beneath a banyan in Mumbai where stockbrokers would gather in the mid-19th century. 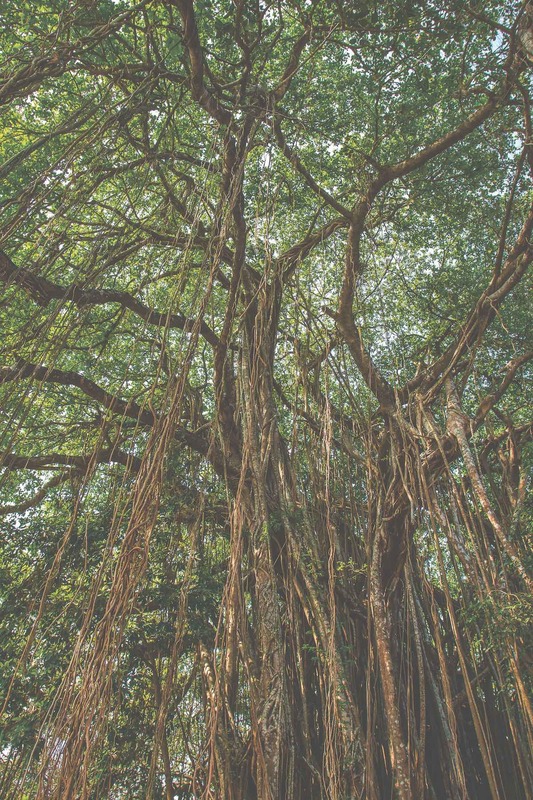 Today the banyan tree is considered to be a focal point in India as a gathering place for village councils and meetings (who needs to sit in a dismal boardroom when you can converse underneath such a marvelous tree?). In many cities today the banyas are cut down by construction companies or to make way for roads, but there is one remarkable woman who has made it her life mission to keep them thriving in her native India. Saalumarada Thimmakka, born into a poor family, was married off to a farm laborer and expected to start a family. However, after 25 years of marriage she could not get pregnant. Thimmakka and her husband began planting and taking care of banyan saplings after relatives and neighbors shunned her for being unable to bear a child. The social stigma of being childless no longer bothered her as she and her husband started an ambitious project to grow and look after trees, like their own children. In fact the couple has planted and tended to 300 banyan trees that stretch for four kilometers from Thimmakka’s village of Hulikal to the next one. The work was by no means easy. After a hard day’s work on the farm Thimmakka still had to dig holes, plant samplings collected from the vicinity, and carry water for several kilometers from the nearest well to nourish her trees. Thimmakka’s husband, who passed away in 1991, used to help his wife with carrying water and by planting thorny bushes around the banyans to protect them from hungry wild animals. Her local community sees her as a role model today and she was given the name “Saalumarada,” which means “row of trees” in her native Kannada language. 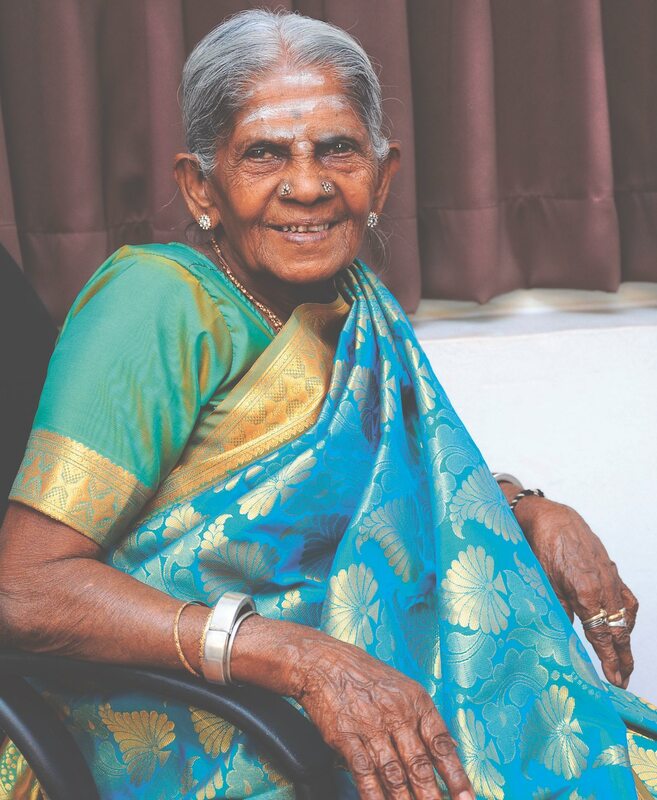 Thimmakka has earned many awards over the years and even has a foundation in her name. In 2016 she made it onto the British Broadcasting Corporation’s 100 Women list, where the world’s most influential and inspirational women are featured. Today at 105 years of age, Thimmakka is no longer physically active tending to her trees but she still gets invited to many afforestation programs in India. She is also working on other green projects, such as one for conserving rainwater in her village. Her dream is to construct a hospital in her village in remembrance of her late husband, and a trust has already been established for this purpose. With Thimmakka’s passion and determination, there is little doubt that this hospital will someday come to fruition. Let’s hope that she will still be around to see it.